The most successful ecommerce and retail businesses are metrics obsessed. Virtually every marketing and business decision in these organizations is guided by data. After all, if you can’t measure something, you have little chance of improving it. Selecting the right ecommerce key performance indicators (KPIs) and then tracking/measuring their corresponding metrics. Setting proper benchmarks for your ecommerce KPI list to track success. 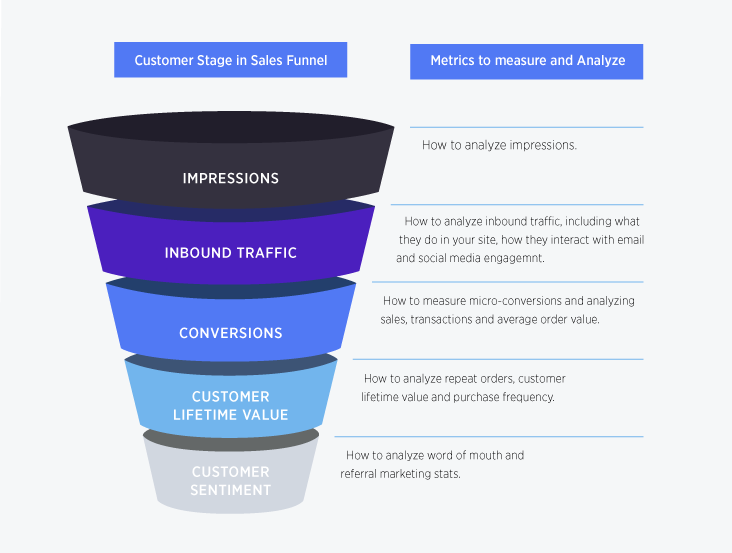 This guide is structured to cover the most vital ecommerce metrics at each stage of the sales funnel of an ecommerce business and their customers’ lifecycle. 1. Selecting the right ecommerce KPIs. To get the right ecommerce KPIs, you have to ask the right questions. What stage is your business in? Start-up, growth, established? What are your overall business goals for this stage? These questions, and ones that will inevitably branch off from these, will help you discover the metrics that make the most sense for your company and its specific goals. Tracking and measuring the right KPIs can improve your business and marketing decisions. Identifying one main metric (OMM), per Lean Analytics, and choosing 3-7 supporting metrics that guide you toward your OMM is a beneficial approach. This helps you avoid decision paralysis from too much information. Customer Lifetime Value (CLV): The estimated amount of total purchases a customer will make with your business over the lifetime they are with your brand. Cost Per Acquisition (CPA): This is the amount you pay for a customer acquisition (lead or sale, this is defined by you) based on your marketing efforts. Return on Ad Spend (ROAS): This your revenue generated from your marketing efforts divided by your marketing costs. Value-per-Visit: This is total website revenue divided by total website visits, and is helpful in measuring the effectiveness your various marketing channels. Google Analytics is the go-to tool for tracking website performance. This is true for ecommerce sites as well. To set up Google Analytics tracking on your site, copy your Google Analytics ecommerce tracking code found in Admin > View > Ecommerce Settings. 3. Setting up proper benchmarks for your ecommerce KPI list. Benchmarks are vital to your business’ growth. They provide insight into what is working, what isn’t, and your growth rate for your KPIs. You can benchmark your key metrics in six easy steps. Step 1: Determine your long term goals. Step 2: Determine how your site is currently performing. Step 3: Identify which areas you’ll focus on for measurement. Step 4: Determine the correct metrics and KPIs to track success. Step 5: Set your benchmarking schedule. Step 6: Work, measure, adjust, repeat. Customers have different intents as they move through your buying cycle. Understanding their intent in each phase will help you select the right key metrics to measure and grow your business. In the brand discovery stage of the funnel, the focus of all your marketing efforts is really on generating awareness and stimulating the realization of a want of your brand/product(s) in the market you target. In other words, you are tracking brand awareness, impressions, and eyeballs. One caveat here is the assumption that your marketing is focused on your target audience. If it isn’t and there is no deliberate targeting in your marketing. This is a vanity metric. Marketing in the consideration stage of the funnel is focused on convincing potential and existing customers to engage with your brand, with the end goal of potentially purchasing your product(s). This is where you should be tracking and analyzing metrics related to inbound traffic to your store, email, and social media engagement. At the conversion stage of your funnel, you need to track and analyze actions that typically lead to a sale (micro-conversions) as well as establish standard metrics like revenue, transactions, and conversion rates (CVR). Online retailers can take this to the next level by diving into rich user data that lets ecommerce businesses track more advanced KPIs at a behavioral level. For example, transactions are expected to be made by the highest engaging customers and visitors to your site. Understanding the these metrics and KPIs will help you make better sense of your sales and revenue data — and help you spot trends to convert more visitors into buyers. A repeat customer can provide a ton of value to a business. Measuring customer retention should form the starting point to understanding and improving customer loyalty. The advocacy stage analyzes word of mouth and referral marketing stats. User generated content is a great way to allow your customers to advocate for your brand. This can be done through video and photo content or leaving reviews. In other words, engage with your customer base seeking honest feedback and showcase how they engage with your products. This kind of social proof is more valuable to new customers. There are innumerable metrics your brand can measure to evaluate success. But, you also must weigh your time spent as part of the equation when determining if these are the proper business KPIs to focus on. You can’t measure inactivity, and staring at a dashboard all day gets nothing done. Here is an overview of important metrics to consider measuring that can help grow your online business. Facebook & Instagram’s ‘reach’ metric. YouTube and other video hosting platform impressions. Google AdWords and Bing ad impressions. Organic impressions via Google Search Console. TV, Podcast and media advertising reach. Average order value (AOV) of customers. Micro to macro conversion ratio. Number of visits to sale. CPA or Cost Per Acquisition. Track product and seller reviews. 1. Your brand’s online visibility (product discovery KPI). This is, in my opinion, the most important marketing metric to track from day 1 and then all through the lifespan of your business. People searching for your brand are more likely to either convert as customers or are returning customers. This is because they are aware of your brand and intend to engage with you when they are looking for you. You should also try and map specific publicity campaigns with brand name searches. As an example, if you engaged with a group of influencers over a specific month, you may want to backtrack on brand name search during the month of the campaign to see if there was any lift. 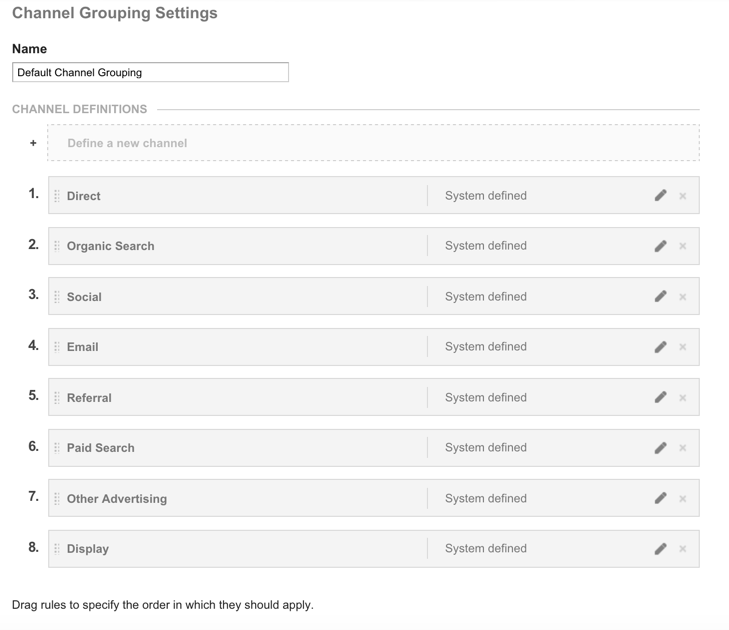 You can organize this effectively well in Google Analytics via Custom Channel Grouping. Example of Google’s Default Channel Organization. 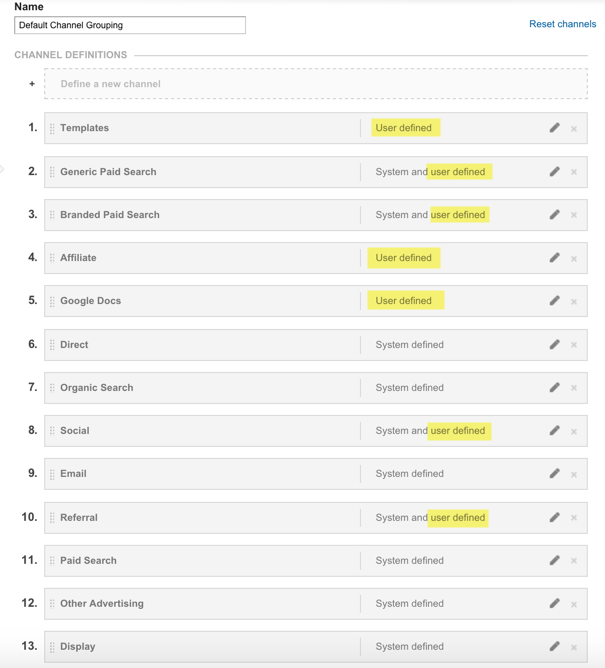 Example Custom Channel Organization in Google Analytics. 2. Online and offline impressions (product discovery KPI). 3. Facebook & Instagram’s ‘reach’ metric (product discovery KPI). Facebook measures unique impressions with the ‘reach’ metric. Facebook’s reach metric is the number of people that have seen your ads at least once. The key point to note here is that the reach metric is different from impressions, which may include multiple views of your ads by the same people. Note that the above is for paid Facebook advertising. In order to track total number of people that have generated impressions in both organic and paid Facebook posts, use the reach metric in the Facebook Insights report. 4. YouTube and other video hosting platform impressions (product discovery KPI). 5. Google AdWords and Bing ad impressions (product discovery KPI). 6. Organic impressions via Google Search Console (product discovery KPI). It gives you an idea on the number of times your website was served as a result on Google’s organic search result, serving as a good KPI for overall reach. If your reach far outweighs your traffic, it’s time to think about revising your title structure to encourage more click through. I also track the ‘Average Position’ metric on a monthly basis. 7. Influencers and partner reach (product discovery KPI). Monthly readers (total and organic). As well as the size of their email list. On your own, research their social media followings and how engaged their audiences are across platforms. 8. TV, Podcast, and media advertising reach (product discovery KPI). 9. Onsite traffic metrics (consideration KPI). These are the most important on-site traffic key performance indicators you should measure on a monthly basis. These metrics (plus many others!) can be found in Google Analytics, the easiest way to establish measurement on your website. There are many other great web analytics tools out there that offer comparable metrics, though these other platforms sometimes call them by different names. For example, Sessions in Google Analytics goes by Visits in other platforms. 10. Organic traffic metrics (consideration KPI). Avg. Position: This is average ranking of your website’s URLs for the Google search queries. 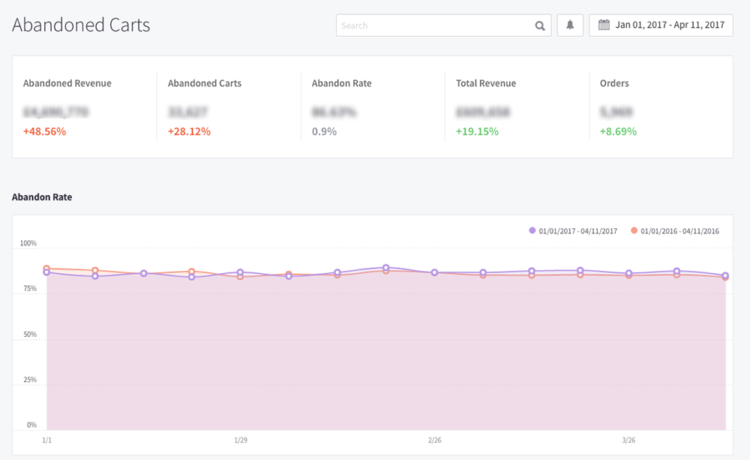 I track all of the above metrics on a monthly basis to better understand the direction each store I manage is headed, traffic and engagement-wise. 11. Email engagement metrics (consideration KPI). These are the top six email engagement KPIs for ecommerce sites that your email marketing team should report to you on a monthly basis. Email click-through rate: This is the percentage of email recipients who clicked on links in emails. It is calculated by:(Total clicks OR unique clicks ÷ Number of delivered emails) * 100. For example: 1,500 total clicks ÷ 75,000 delivered emails * 100 = 2% click through rate. 12. Social media engagement metrics (consideration KPI). 13. Number of online transactions (conversion KPI). 14. Average order value (AOV) of customers (conversion KPI). 15. Ecommerce micro-conversions (conversion KPI). 16. Micro to macro conversion ratio (conversion KPI). They will be able to target their efforts into either increasing overall fabric sample requests or improving the sample-to-order ratio. The latter could be accomplished by testing and optimizing email communications to visitors who have requested a sample. 17. More specific sales data (conversion KPI). 18. Number of visits to sale (conversion KPI). 19. Sales conversion rates (conversion KPI). 20. Analyze micro conversions (conversion KPI). Calculate conversion rates for micro conversions by dividing the total number of the specific micro conversion (their goal completions in Google Analytics) by sessions and multiplying the value by 100. This way, you know what kind of micro conversions to expect with a varying volumes of traffic. It is also a leading indicator of cart abandonment on your site, which is a low hanging fruit for many online retailers. 21. Shopping cart abandonment rate (conversion KPI). When your conversion rate is low, you need to understand how many visitors had an inclination to buy. To do this, you’ll want to examine your store’s cart abandonment. This metric indicates the percentage of visitors who added products to their shopping cart but did not complete the checkout process. The lower your cart abandonment rate, the better. As a quick example, your shopping cart abandonment is 75% if 75 out of 100 visitors with a cart leave without buying. Cart abandonment is the closest you come to earning real customers before they leave your site. Adding to the cart typically indicates an intent to purchase. The fact that they leave without buying means you lost potential customers. It gets especially bad if you paid a lot of money to get these visitors to your store. Making sure your cart abandonment is low is key to improving your conversion rate. 22. CPA or Cost Per Acquisition (conversion KPI). CPA is a critical marketing and business metric, informing your bottom line and helping to measure the effectiveness of your paid media efforts. Studying CPA by channel helps you understand what channels and campaigns to invest more budget and time into, and determine the poorest performing channels that should be scaled back or discontinued. 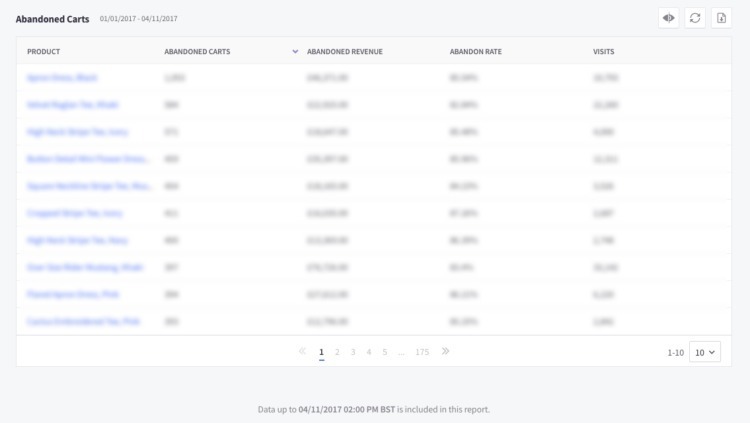 Startup ecommerce businesses need a monthly CPA dashboard as a matter of survival, and to wisely spend limited marketing budgets. I look at the CPA numbers and make hard decisions to either stop marketing or optimize campaigns on channels that are deemed unaffordable due to their high CPA. 23. Average order size (conversion KPI). You know what the value of a visitor is, but what about the value of an average sale? Divide the revenue by the number of transactions and you’ll understand how much each customer delivers to the bottom line. Looking to boost your average order size? Consider offering free shipping at a certain dollar amount or volume discounts. 24. Percentage of mobile visits (conversion KPI). If your website isn’t optimized for mobile or if you’re not tracking traffic from your mobile site, you’re in trouble. 25. Ecommerce purchase metrics (retention KPI). Repeat purchases rate: This key metric shows the portion of repeat customers from your overall customer base. It is a primary retention marketing metric and is calculated by dividing the total number of customers that have purchased more than once by total number of customers. 26. Average customer lifetime value (retention KPI). Customer lifetime value (CLV, CLTV, LTV or LCV) is the expected revenue generated by future sales interactions with a customer. On average, you might be looking at three years, but it will be best to assess this on a case by case basis. 27. Ecommerce churn rate (retention KPI). If your LTV is low, it could be that many of your customers buy once and never return. Churn is the percentage of your customers who do not come back to your site. The lower the churn, the better. For example, a churn rate of 80% means 80 out of 100 customers do not come back to buy from your store. As we have seen, to ensure a high profit, it’s important to influence your customers to keep coming back to purchase. That means you want your churn to be low so that once you acquire a customer, they continue to come back and purchase again and again. Lower churn means higher LTV and a healthier business overall. 28. Net promoter score (advocacy KPI). 29. Track product and seller reviews (advocacy KPI).